hockey | Are We There Yet? Perhaps no other holiday evokes more guilt from me than Easter. As my father was a devout catholic, this was his most favorite religious holiday; and with my mother a protestant, I was always well dressed for Easter, complete with new white shoes, a hat, and a new dress — although often hand-made or handed down from my older sisters. These memories flooded through my mind as I sat with my children at the local diner Easter morning, where we ended up because Russ and I realized we were out of eggs for breakfast. And out of bacon. And we didn’t want to serve pancakes because they had more than enough sugar in their Easter baskets to last well through summer vacation. The longer I sat watching my rag-tag family, the more I chafed. Both daughters sported dirty hair, Katie wore a yellow fleece that was so dirty it looked brown and Olivia was wearing the same hockey sweatshirt she’s worn every day for the last three weeks. The clincher was Russ, who chose to entertain our 8 and 11-year olds by hanging a spoon off the end of his nose. I sat there and wondered where had things gone so wrong? Why aren’t my children dressed up for Easter? No hat. No miserable white tights to match the shoes. Dear God, why aren’t they even wearing clean clothes? And Russ, for goodness sakes, really? A spoon on the nose? We are eating OUT. Truth is, I don’t normally care too much about these things. I’m a pretty easygoing mom, to say the least. But as I looked about the diner, filled mostly with single older adults, or older couples eating before dashing out to Easter Service, inferred by their unusually nice dress for Vermont on a Sunday, I saw only my failures as a parent. I should be torturing them by making them go to one of the two most boring yet beguiling of church services: the death and the resurrection of Jesus. I should be torturing them by making them wear scratchy tights whose crotch reaches your knees by mid-service. I should torment them a bit more with long days visiting with very old relatives who smell funny. I should make them eat an early dinner comprised of mushy vegetables, ham, and scallopped potatoes using only their best manners. But no, I took them out to breakfast because I ran out of eggs at home, and I let them out of the house looking like scallawags. Happy Easter!? I hoped no one would greet me that way today. I didn’t feel like I deserved it. I was not being the best breakfast mate. I excused myself from the table to the restroom, to escape my husband’s spoon-dangling nose and my grubby kids and gathered my thoughts. No, this was not our best effort for Easter. This is, however, the first Easter we’ve been completely disengaged from church all year, because Olivia’s hockey schedule and our chosen church’s schedules are incompatible. And we’ve been busy all weekend attending hockey games of the Women’s World Championships (IIHF) in our little town – a rare opportunity to see the world’s best women hockey player! And with both my parents are deceased and no family within a four hour radius, we’re on our own for this and most traditionally “family” holidays.OK. So those are my excuses. As I wrangle with guilt that I don’t take my children to church, that they don’t really understand Easter’s Christian symbolism, and only associate Easter with the chocolate the the Easter “bunny”, I remember that my best and abundant memories of the holiday are not about the church piece. 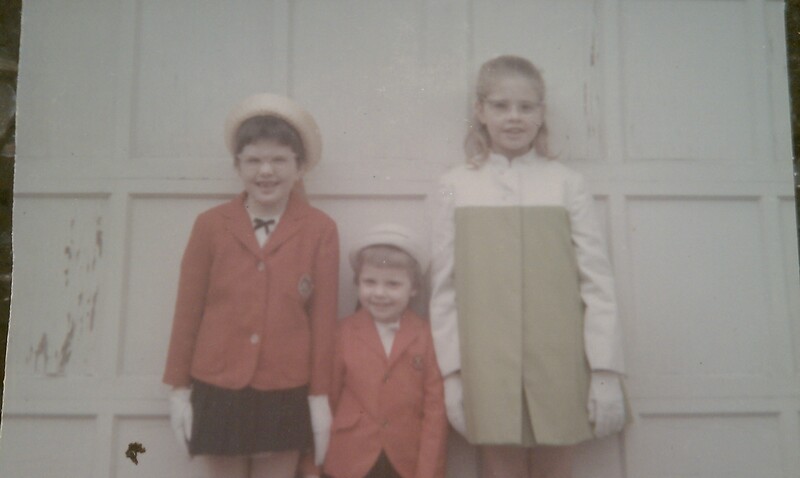 Dad and Mom would be so angry with each other because we were late to church and had to stand in the back — a given for the Christmas and Easter catholic masses when my mother indulged my father by letting us go to church as a family — as opposed to him going to mass while we went to the Presbyterian service with Mom. I did like getting new clothes, but I hated having to wait for Easter to wear them. In the end, after so many years away from home, my strongest memories are of looking for the Easter eggs my mother would have hidden all through the house, in the cleverest of locations and the joy of the hunt. I remember the basket next to my bed first thing in the morning. Those are my most fond memories. And those are the ones I have worked to make for my children. Am I doing another disservice to my kids? Maybe. Do I want them to be church-less? No. Do I want to take them only to church on Christmas and Easter? Absolutely not! I could have married someone who was a regular church-goer, a true believer and marched my kids through sunday school and bible school in the summer. But I didn’t. I married a questioner, and a deep-thinker. And we respect each other for our different approaches and together we are trying to raise children who think and ask questions and formulate their own opinions. We will get to religion. We will. It’s not like we don’t discuss it. We ARE raising morally strong children. OK. So, back to the breakfast table. I vowed to wash the girls clothes. And to make them take a bath today. And then the food came and I didn’t have to worry about that spoon on Russ’ nose any more. Arrggggh, how I anguished over pulling my kid from school for a hockey game. What WAS that about? I talked myself blue and I ran scenarios through my head for so long I almost forgot what the big deal was. I talked to the head coach. I talked to the assistant coach. I talked to the girls overall scheduler, who is also a school principal. I talked to my friends. I talked and talked and talked and talked to my dear dear husband, who probably wondered what it was all about by the end, too. Alas, I figured it out. The angst was about taking ownership of the decision. I didn’t like being informed by email that despite the scheduler’s attempt to keep the girls in school he was successful only for the 14-year olds and that the 12-year old teams would have a game at lunchtime on a school day. I hated it. It rubbed me all the wrong ways. I wanted to be the one who decided if she missed school and for what reason. I live in a sports town. Maybe most of America does. But this is a really small town and sports reign large. Even the local weekly newspaper, the Essex Reporter, devotes an entire section to this town’s sports. It feels like as a parent I am expected to just go with the majority action — play travel hockey, take your kid from school, sports rule — forget the rest. It just feels that way. Further, I am the only parent on the team who’s daughter is the oldest/first child in the family. And all but one of the team-mates have an older sibling who also plays or played hockey. So all those other parents, potentially, have already rolled-over for the sports machine and already just go with it. I truly felt alone in this. So anyway, I was feeling like taking a 9-year old from school to play a game up in hockeyville was a bit over-the-top. I want my athletic daughter to understand that school is most important. Sports are extra. And that was it. I decided to approach her teacher about helping me teach this concept to Olivia. He was ALL over it. My gosh, I love her teacher. Turns out, he was a student athlete and he said his parents did the same thing. So he agreed to give Olivia some “make-up” assignments to do over the weekend in lieu of the time missed at school. And he added that he saw how sports were a motivator for my daughter and hockey in particular was her passion — that there’d be value in supporting her this way. God bless my little “O”, because when I told her what I had decided, she smiled. The morning of her game I took her to school with a note for the teacher about leaving early and she said “And I’ll ask Mr. G for extra homework”. And so the angst. The decision-making process. It was all worth it. Hockey Week 2: She’s Only Nine! Oh god. It is only the second full week of hockey and it feels like 2 months already. I can’t imagine even surviving to month two (let alone month FOUR!). The schedule has been wacky; Wednesday and Thursday practice this week last week tues and weds. Tryouts were this past weekend. My girl will play on the U12 Girls A/B. This makes sense, as she is only NINE years old. Haven’t I mentioned this before? She’s Only NINE! I kept checking the website to see if she would be placed on the A team. I didn’t think it was possible based on her age and the size of the bigger girls, but I AM new to this team, so I was anxious. the A teams travel MORE than the A/B teams. So I needed to know if I should start my meltdown this weekend or if I could get a few more things done before it happened. So, thank goodness, I’ve got more time to go crazy. The practice schedule this week goes like this. Wednesday 6:15-7:30 in Waterbury. That’s a forty minute drive from here. Tack on 15 minutes (min) before and after the practice for suiting up and down and we’re looking at a 5:15 departure and an 8:30 arrival back home. Tack on another 30 minutes, minimum, for the kid to return to earth and chill before hitting the sack. The next practice is Thursday 7:30-8:40 at Essex. Fortunately, the drive is shorter…just 5-10 minutes. Tack on the wardrobe change time and the chill-time and we’re looking at a 9:45pm likely bedtime. Uh, hello? SHE’s ONLY NINE? Huh? How about a little coach’s meeting with the parents! Oh, and I don’t know who her coach is yet, so I’ve got no one to call and say this is too much, SHE’s ONLY NINE! For fear of disgracing my child and my family with my protectiveness and attitude, I’ve put Russ onto the task of communicating with the coach..once we know who he/she is. Hang on tight Julie. The ride is just getting started.